I’ve been slightly obsessed with fake-shopping for indie polishes lately. When I say fake-shopping, I mean that I go on etsy, find a ton of polishes that are gorgeous, put them in my shopping cart, and then see how much the total is and then quickly close out the window. I really want a TON of indies, but unfortunately don’t have the funds available. But the indie brand that I obsessively follow and spend way to much money on is Hare Polish. And when Nikole announced that she had a new summer collection based around the Tropics, I quickly jumped on the etsy release and picked up 2 new polishes. So while I’m waiting to get those in the mail, I figured I would show you guys one of the Hare’s that I bought last spring! Yes, its taken be that long to blog about it. 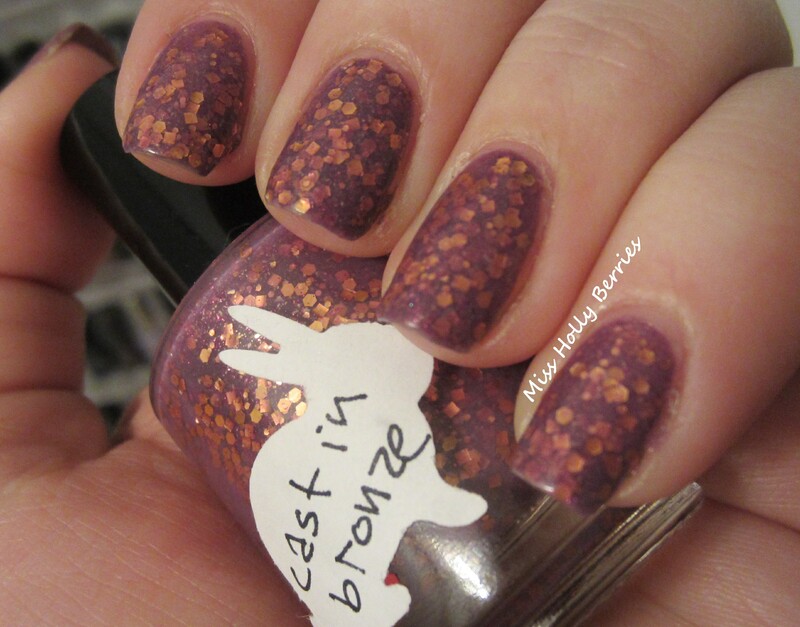 Hare Polish “Cast in Bronze” is a medium toned warm purple jelly base with bronze chunky glitter. Cast in Bronze has bronze hex’s, squares and smaller glitters in there. The color combination is so pretty but simple at the same time. Because there’s only the purple and bronze, its easy to admire the beauty of this polish without getting bogged down by 10 different shapes and colors. The formula on this polish is thick, to say the least. 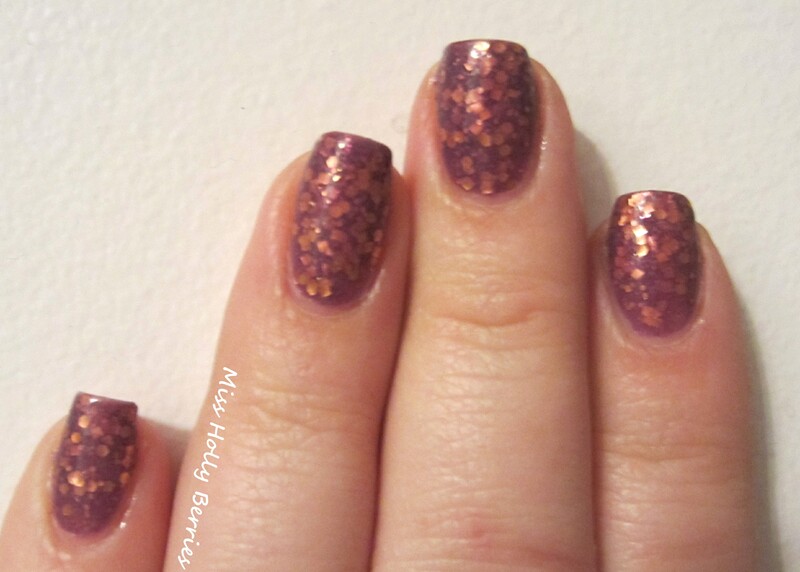 It is so packed with glitter that its almost hard to get it to apply to the nail. However, because its so packed with glitter, its also really opaque. This is just 2 coats and its completely opaque. The dry time is also amazing because its so packed with glitter. However, I would warn you that you’ll need at least 2 coats of a good top coat to get this polish smooth. But its so pretty that it doesn’t bother me how thick it is! ← July Beauty and Nail Polish Favorites! Plus some Empties! Glad to know I’m not the only “fake shopper” out there 😉 Love this polish, especially the purple base. I was just noting the other day how great bronze/copper looks on top of so many different colors! same here! etsy is like my downfall lol and thanks for commenting! i thought it was just me too until i wrote that and apparently a lot of us fake-shop. thanks for commenting girl! That’s really pretty. I’ve had a bunch of Chirality holos sitting in my Etsy cart which I have so far managed not to buy. The other thing I do on Etsy is carefully add things to my favorites so that it will look pretty on the Blogger Etsy applet on my blog. That lets me window-shop around without being quite so tempted to buy. i have the whole chirality serial killer themed collection (the 4 of them) in my cart lol i wish i had the funds to play with them!